Passed away on Monday, November 23, 2015 at Saginaw Geriatrics Home surrounded by her loving family. 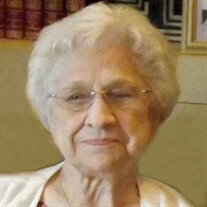 Lorraine was the last of 13 siblings born to Mary (Duprey) and Peter Duby. She was born on October 20, 1923, just recently celebrating her 92nd birthday with family and friends. Lorraine met and married the love of her life, Joseph Gardyszewski at St. Casimir Church on June 4, 1943. Joe predeceased her on March 22, 1987. Together they raised six daughters. Daughter, Marcia K. (Dennis) Prevost of Saginaw, MI, granddaughter, Michelle K. (Michael) Goad, great-grandchildren, Amanda (John) Wade, great-granddaughter, Kayla Brock, great-grandson, Dakota Brock, and twin great-granddaughters, Emelie Goad and Caroline Goad, grandson, Dennis Joseph Prevost, granddaughter, Kelly L. (Larry) Unrein, and great-granddaughters: Danielle Unrein, Nicole Unrein, and Krystle (Ryan) Rodriguez, great-great-grandson, Dominic, grandson, Marc E. Prevost (Geni Claus); Daughter, Ginny L. (Keith) Taylor of Aurora, CO, granddaughter, Robin (Justin) Hayes, great-grandchildren, June and Joseph, grandson, Brandon Taylor, granddaughter, Marcie Pnacek; Daughter, Peggy A. (the late, Tom) Rapin of Saginaw, MI, granddaughter, Melissa (Jeff) Lazzaro, great-grandchildren: Cameron Swick and Courtnie Swick, granddaughter, Paula Gorney; great-grandson, Brenden Gorney, granddaughter Karrie (Brian) Klopp, great-grandchildren: Brianna, Katie, Bernadette, Kristina, Bridget, Kolette and Brandon, the late Kasey, a new great-granddaughter due in January 2016; Daughter, Connie J. (Lee) Hoffman of Mt. Vernon, ME, grandson: Bernie (Keri) Hoffman, grandson, Todd (Anne Marie) Hoffman and their son; Daughter, Jacqueline Serrato of Tucson, AZ, grandson, Kevin (Jenny) Serrato, great-grandchildren: Emma, Parker and Maelyn; Daughter, Cheryl A. (Dean) Eisenhauer of New Lothrop, MI, grandson, Jeffry (Jennah) Fry, great-grandchildren: Lucus and Noah, Grandson, Jason (Lindsey Fry, great-grandson, Jaxson, granddaughter, Chelsey Cross, great-granddaughters: Jaidence and Greyah, grandson, Joshua Eisenhauer, great-grandsons: Asher and Tristen, granddaughter, Chantal Eisenhauer (fiancé, Chad Schroeder), and grandson, Colton Eisenhauer. Also surviving are many loved nieces, nephews and their families; brothers-in-law, William (Dolores) Gardyszewski and Mary (the late, Walter) Gardyszewski; and a beloved niece and special friend, Delores Sanderson. Lorraine was predeceased by her siblings: Blanche (Charlie) Deno, John Duby, Harold (Anne) Duby, Louis (Bernice) Duby, Belma (Elmer) Allore, Napoleon (Lila) Duby, Roy (Lorraine) Duby, and Dorothy (John) Sharar. She was also predeceased by her husband’s brothers and sisters and their spouses. FUNERAL: A Funeral Service will take place at 2:00 p.m. on Wednesday, November 25, 2015 at the Deisler Funeral Home, 2233 Hemmeter Rd. (off State). Rev. Fr. Peter J. Gaspeny will officiate. Rite of Committal will follow at St. Andrew Cemetery. VISITATION: Friends are welcome to visit with the family at the funeral home on Wednesday from 12:30 p.m. until the time of the service at 2:00 p.m.
MEMORIALS: In lieu of flowers, those planning an expression of sympathy may wish to consider memorials to the Spinal Muscular Atrophy Foundation, 888 Seventh Ave., Suite 400, New York, NY 10019. Please share your thoughts and memories with the family at the funeral home or through www.deislerfuneralhome.com.